Monday, August 8 – About an hour after sunset, look for the crescent Moon low in the west/southwest for northern hemisphere viewers. Check out Venus less than a fist’s width to its lower right and Jupiter less than a handspan to upper left. We’ll keep watch this week as the Moon passes by Jupiter and bright stars – Spica and Antares. For the rest of us, take the time tonight to really study the fully emerged Mare Crisium region telescopically. Look for the small punctuation of craters Pierce toward the northwestern area and Pickard to its south. Can you make out the bright peninsula of Promentorium Agarum on the eastern shore? Tuesday, August 9 – Tonight after sunset, look again at the crescent Moon and you’ll discover that Jupiter now sits a few scant degrees above its left shoulder. When the stars begin to appear, look for bright Spica about a fist width south of Jupiter. Tonight we’ll have a look at the smooth sands of Mare Fecunditatis to the lunar south. Binoculars will see the bright, shallow ring of Langrenus on its eastern shore. For telescopic users, this is a great opportunity to pick up two small challenge craters located just northwest of central in Fecunditatis – crater Messier to the east and its companion crater Messier A to the west. Wednesday, August 10 – For viewers along the eastern sections of both Canada and the US, get your binoculars out and have a look at the Moon right after sunset. Just below the southern cusp you will spot Spica. Watch over the next two hours as the skies fully darken and the distance between them widens as the pair sets. On the lunar surface, look for the three rings of Theophilus, Cyrillus and Catherina on the edge of Mare Nectaris to the south. A bit further south, you will note a long bright feature known as Rupes Altai, or commonly referred to as the Altai Scarp. This 967 km (600 mile) long feature stretches in an arc from crater Piccolomini through the south shore of Mare Tranquillitatus. While its height doesn’t exceed more than 1.6 – 3.2 km (1 to 2 miles), lunar sunrise highlights it to perfection and you will notice that it is much stronger to the south. Thursday, August 11 – On this date in 1877, Asaph Hall of the U.S. Naval Observatory was very busy. Tonight would be the first time he would first see Mars’ outer satellite Deimos! Six nights later, he observed Phobos, giving Mars a grand total of two moons. Be sure to watch as Mars begins rising around midnight. Tonight is the peak of the Perseid meteor shower, but we’ll need to kill about three hours until the Moon sets. If you can’t nap, then look for Venus low on the horizon and notice that Jupiter and Spica are slightly closer together. On the lunar surface, binoculars will see the central Mare Tranquillitatus. For telescope users, on its eastern shore you will see the small bright ring of crater Arago – but don’t stop there. Continue east towards the terminator and watch for a thin, black line that cuts through the foothills. While most rilles are usually within mare areas, the Rimae Ariadaeus is one of the few sufficiently wide enough to be spotted against such a bright background. Running around 233 km (145 miles) long, this is known as a Graben type depression and it only averages around 1.6 – 3.2 km (1 – 2 miles) wide. Although it appears relatively straight, it’s actually a collection of offset segments. The Perseids are undoubtedly the most famous of all meteor showers and never fail to provide an impressive display. Its activity appears all the way back to 36 AD in Chinese history. In 1839, Eduard Heis was the first observer to give an hourly count and discovered their maximum rate was around 160 per hour at that time. He, and other observers, continued their studies in subsequent years to find that number varied. Giovanni Schiaparelli was the first to relate the orbit of the Perseids to periodic comet Swift-Tuttle (1862 III). The fall rates have both risen and declined over the years as the Perseid stream was studied more deeply and many complex variations discovered. There are actually four individual streams derived from the comet’s 120 year orbital period which peak on slightly different nights, but tonight is our accepted peak. Meteors from this shower enter Earth’s atmosphere at a speed of 60 km/sec (134,000 miles per hour), from the general direction of the border between the constellations Perseus and Cassiopeia. While they can be seen anywhere in the sky, if you extend their paths backward, all the true members of the stream will point back to this region of the sky. For best success, position yourself so you are generally facing northeast and get comfortable. The radiant will continue to climb higher in the sky as dawn approaches. Around midnight, watch as Mars joins the show and Saturn honors us in the east about an hour before sunrise. Friday, August 12 – Practice astronomy in the daytime? Why not! When the Sun reaches its highest point today in the northern hemisphere, you see the Moon rising in the southeast. Watch as the skies darken and you’ll discover red Antares about a handspan to its left. Tonight let’s return to the lunar surface to pick up another surface “scar”. In the north you will see the rugged terrain of the Montes Alpes. Look for the deep, diagonal gash of the Alpine Valley cutting through them. This artificial looking feature runs around 177 km (110 miles) long and ranges anywhere from 1.6 – 21 km (1 – 13) miles wide. It’s a very curious feature and may very well be a reminder of a glancing blow dealt by a large meteoritic body. Saturday, August 13 – Tonight Antares is less than a fist width away from the waxing gibbous Moon. On the lunar surface, we can enjoy another strange, thin feature as well. Look toward the lunar south where you will note the prominent rings of craters Ptolemaeus, Alphonsus, Arzachel, Purbach and Walter descending from north to south. Just west of them, you’ll see the emerging Mare Nubium. Between Purbach and Walter you will see the small, bright ring of Thebit with a crater caught on its edge. Look further west and you will see a long, thin, dark feature cutting across the mare. Its name? Rupes Recta – better known as “The Straight Wall”. It is one of the steepest known lunar slopes rising around 366 meters (1200 feet) from the surface at 41 degree angle. Sunday, August 14 – Look again at the sky tonight as Antares has now moved to the other side of the Moon! 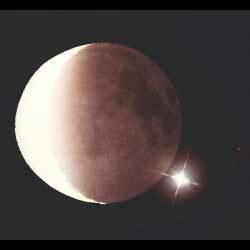 For New Zealand and Australia, you will have the chance to see the Moon occult Sigma Scorpii. You can find details on this IOTA webpage. On this same night, viewers in central northern Australia (in the Broome/Darwin area) will also have a chance to see the Moon occult Antares. Please check this IOTA webpage for precise times. For lunar binocular viewers this evening, two wonderful features are readily awaiting you. Look for the smooth, dark oval of Plato to the north and the emerging grandeur of Copernicus almost central to the terminator. Can you see the wonderful Archimedes between the two – or Eratosthenes hanging onto the tail of the Apennine Mountains?